MACDONALD’S: A notice informs staff that restaurants must be able to accept NFC mobile payments by 15 September. Fast food giant McDonald’s will begin accepting NFC mobile payments in US stores on 15 September, an internal notice sent out to franchisees and seen by 9to5Mac suggests. 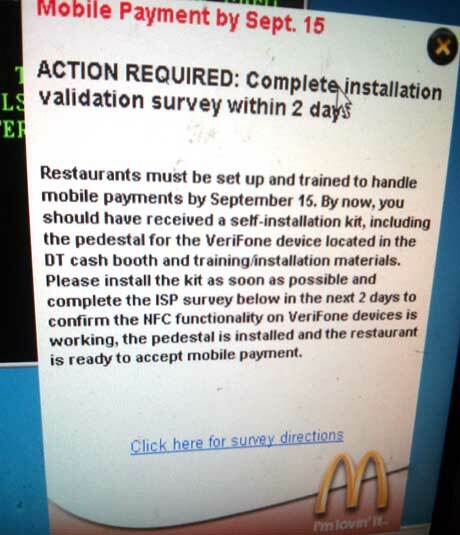 Restaurants have already been sent a self-installation kit, training and installation materials and “must be set up and trained to handle mobile payments by 15 September,” the notice says. Franchisees are required to “confirm the NFC technology on Verifone devices is working”, that a new pedestal has been installed in the drive-thru cash booth and “the restaurant is ready to accept mobile payment” in the next two days, the notice adds. The company has been testing a service that lets customers order their meal before they arrive at a restaurant and then collect it and pay by scanning a QR code at 22 locations in the Columbus, Georgia area since June 2014. That service does not appear to include support for NFC, however. This is somewhat bizarre? McDonald’s has been offering ISIS mobile payments and has had terminals in all of it’s US locations for nearly one year. While many of the clerks and managers have been clueless as to what, or how, the terminals work, I can verify they have been working for at least 9 months, maybe longer. Also, ISIS/AMEX refund $1 back on each purchase, making the dollar meals a bargain. Actually maybe this is because McDonald’s is moving to EMV/chip technology too?